Advice for beginners, or in fact anyone trying to make their life slightly easier, seemed to be ‘use premade pastry’, but as Jus’ Roll had just provided us with a fabulous puff pastry lunch, we decided to take the plunge and make the short crust (allegedly easier) ourselves. 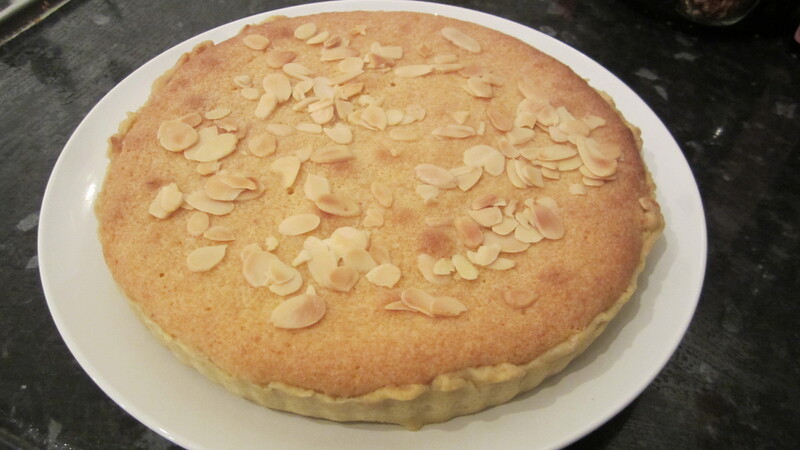 It was our first bakewell, so better make it a proper one! Im afraid to say we didn’t get as far as making our own compote… but you know… got to leave room for improvement. 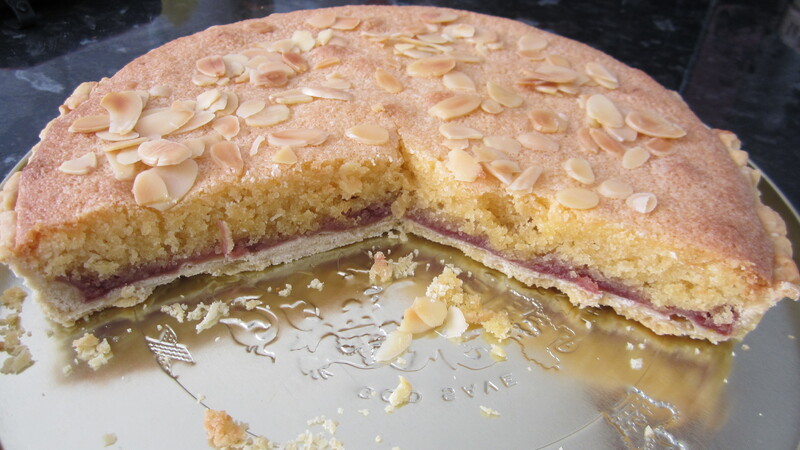 We were very happy for Waitrose’s seedless raspberry jam to join in with the bakewell fun. Baking Beans. These are not baked beans and apparently inedible. This may explain why we could not find them with the other pulses in the supermarket. We have since been informed that they are small ceramic balls specifically for use in the blind-baking of pastry. According to the internet they can be replaced by other dried pulses to weigh down the pastry, however we found that either lentils are not heavy enough, or we were just a little stingy in the amount used. 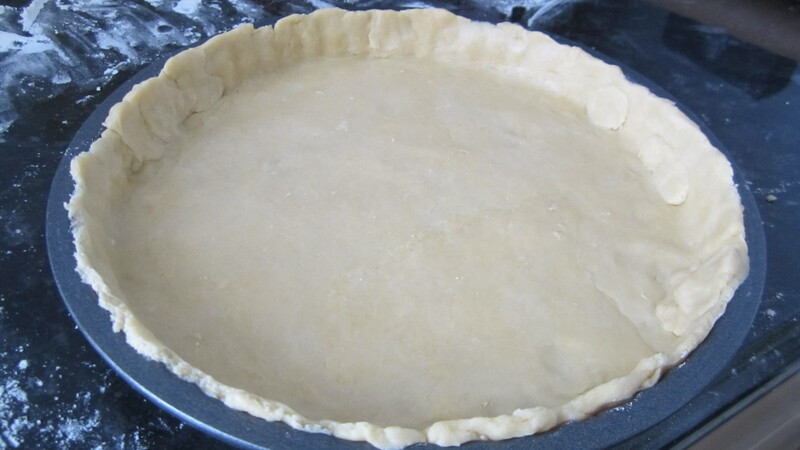 Make it your good practice to weigh down the pastry properly, as bubbles in your pastry base, well… it doesn’t help. Blind-baking was another term we had not come across, and although it may have felt like wondering in the darkness, this simply involved covering the pastry in foil, so it was unable to ‘see’ the inside of the oven. Another term to add to our rapidly increasing baking repertory! So our first experience of this classic bake was in fact a great success. We shall not be scared of short crust pastry creation next time, and neither should you! What will our next baking project be? Suggestions welcome, but otherwise wait and see! Sieve the plain flour into a mixing bowl and add the salt. Chop cold butter into small pieces and mix into the flour. Use hands to ‘rub’ mixture together. Add the water and use hands to combine into a dough. Don’t work the dough too much, and should not be too sticky. Gather dough, once smooth, into a lump and cover with clingfilm. Put in the fridge to rest for at least one hour. Preheat oven to 175 degrees (fan). 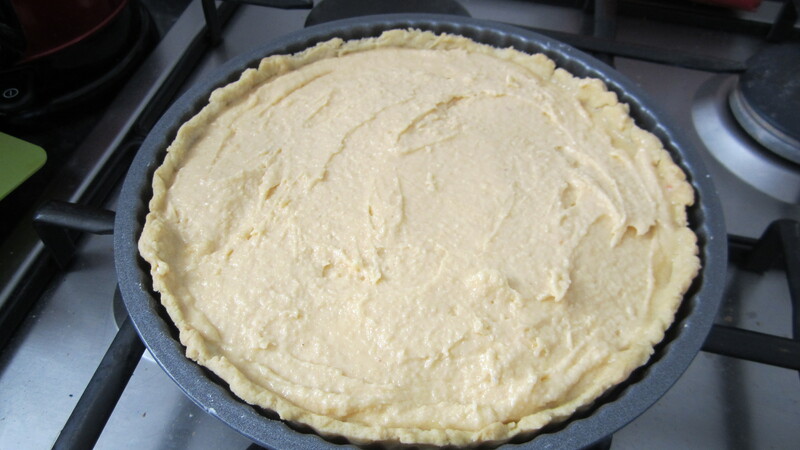 Lightly grease the inside of the tart pan with butter. On a lightly floured flat surface, roll out the pastry to the size of the tin, and line tin with the pastry, pressing to the sides. Then line with foil and fill with baking beans to weigh down the dough whilst baking. Bake ‘blind’ for 15 minutes, then remove the beans and the foil and bake for a further 5 minutes to dry pastry to perfection. Make the frangipane mixture, creaming together the sugar and butter and add the 2 beaten eggs. Then add the remaining ingredients and mix well. Add a generous layer of jam to the bottom of the pastry and cover with the frangipane mixture, smoothing the top with a knife when filled. Bake in the oven for 35 mins, scattering the flaked almonds after the first 20. Remove and cool on a cooling tray. WARNING- second slice may be needed!